The thirteen years between 1919 and 1932 may have been the most turbulent in the history of the Alabama Polytechnic Institute. They began with the controversial resignation of a long-term, popular president and the appointment of a successor who never enjoyed the full support of the college community. During these troubled years, API experienced a series of unsuccessful football seasons, an attempt to move the school from Auburn to Montgomery, the forced resignation of one president, political warfare with the University of Alabama, and charges of unethical behavior against the Cooperative Extension Service. Controversy turned to crisis at the end of these years with the onset of the Great Depression and with shortfalls in state revenues that crippled the college and hastened the downfall of another president who simply lacked the resources to cope with the financial emergency. After a year in office, Dowell reported to the board of trustees that the long and distinguished service of President Thach made the job of his successor “delicate and difficult.” The situation was compounded by the disrepair of buildings and equipment, the college debt, and meager faculty salaries, which, at that time, were paid in quarterly installments. Dowell reiterated a statement first made in his inaugural address: API faced “the slow disintegration” that inevitably followed “a long period of undernourishment.” He called upon the state to appropriate $2 million for a massive building program during the next quadrennium, plus comparable increases in other areas of the budget. He argued that API’s contribution, past and present, to the state’s industrial development; relative lack of support from the state in the past; and the college’s responsibilities for teaching, research, and extension all justified his request for a massive infusion of funds. By the close of Dowell’s second year in office, API faced a daunting new challenge, not to the school’s financial health, but rather to its location. On December 6, 1922, the executive committee of the board met in Governor Kilby’s office to review bids for various construction projects. Kilby reported that a group called the Montgomery Committee, headed by attorney Jack Thorington, wished to meet with the board before any new construction projects got underway in Auburn. Thorington and his group urged the executive committee to consider moving the school to Montgomery, a motion that Kilby apparently supported. Later, the committee met with Thorington, who produced a bill which he intended to introduce to the upcoming session of the legislature. The bill drafted by Thorington and his group called for the relocation of API from Auburn to Montgomery, but not before the city provided land and buildings for the campus. The trustees, led by Thomas D. Samford, flatly rejected the proposal and urged Thorington to cease all further agitation on the issue. President Dowell, who was absent at the first meeting, offered only a half-hearted resistance to Thorington’s bill. The president’s seemingly weak response cost him the support of the board, faculty, and the student body. Dowell met with the board of trustees early the following year at the annual meeting, which marked the beginning of a general downturn in the efficacy of his policies and the popularity of his administration. Topping the board’s agenda was the mounting crisis caused by the resignation of football Coach Mike Donahue after a successful season. Dowell commented that Coach Donahue’s resignation was “viewed with alarm by practically the entire student body and a large majority of the alumni.” Making matters worse, Dowell stirred controversy when he recommended that all athletic funds reside in the college treasury. Three months later, Dowell became entangled in a political battle when he criticized a millage tax proposed by newly elected Governor William V. Brandon that would substitute for, rather than supplement, API’s current appropriation. The president stated that he was “unwilling to accept the responsibility for the continuance of the present deplorable situation” confronting the college without making the strongest possible protest regarding API’s financial relationship with the state government. Furthermore, he complained of the “constant difficulty and unpleasantness” involved in dividing the state’s resources for higher education among competing institutions. 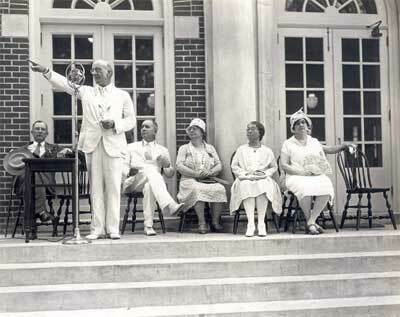 Farmers gather in front of Langdon Hall while attending Farmer's Week events in August 1929. In 1923, a festering controversy regarding the Alabama Cooperative Extension Service came to a head. Upon taking office, Dowell had appointed Luther N. Duncan, an API graduate and Extension Service veteran, as director of that agency. Early in his tenure, Duncan organized the Alabama Farm Bureau Federation, a state branch of the American Farm Bureau Federation, which provided a cooperative purchasing and marketing mechanism for farmers. An older and more militant farm organization, the Farmer’s Union, complained that, under Duncan, the Extension Service gave favorable treatment to the Farm Bureau, with county farm and home demonstration agents actually taking part in the organization of the Farm Bureau at the county level. This charge surfaced when the Farmer’s Union and the Farm Bureau organized rival cotton-marketing cooperatives, with the former complaining that Duncan and the Extension Service favored the Farm Bureau, which was undoubtedly true. Meanwhile, Duncan consolidated his control over the Alabama Farm Bureau Federation by engineering the election of his friend and political ally, E.A. O’Neal, to the presidency of the organization. Critics charged that Duncan wanted “absolute control and management” of the Farm Bureau so he could “pop the whip” over the legislature, with O’Neal wielding the instrument. After a board of trustees’ investigation of the situation found no wrongdoing, Duncan’s reputation as a skillful political figure was firmly established. API alumni began voicing their dissatisfaction with Dowell’s administration when the 1924 football season ended with four wins, four losses, and one tie. On December 4, a group of Jefferson County alumni held a mass meeting in which they called for Dowell’s resignation. Although their reasons were vague, the situation quickly developed into a crisis. Trustee and Birmingham News publisher Victor Hansen charged that the group was motivated by an unsuccessful football season and that their complaint lacked substance. Associate counsel for the Jefferson County alumni group, Joel F. Webb, called for Dowell to be “tried before the board of trustees” and summoned all the faculty and students, except freshmen, to appear as witnesses against the president. On January 12, 1925, Governor Brandon called a special meeting of the board of trustees in his office. He read a letter from Victor Hansen, which called the governor’s attention to a newspaper statement by Attorney Webb, who questioned President Dowell’s ability to continue in office. Webb also challenged Hansen’s ability to judge the president because of a pro-Dowell editorial that had appeared in the Birmingham News. Hansen responded that it was the purpose of a newspaper to address such issues, and, moreover, as a member of the board of trustees, it was his duty to stay informed of issues relating to the college and to formulate opinions and policies. Hansen denied that this made him unfit to fairly judge President Dowell, but offered to submit the issue to the full board. The board affirmed its confidence in Hansen and called upon Webb to appear before them and specify his charges in writing. 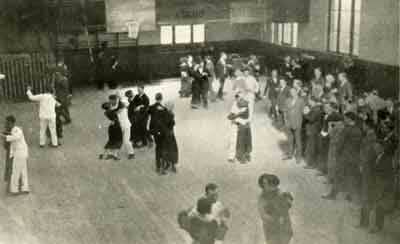 Dances at the Alumni Gym were popular events for Auburn students in the twenties. Appearing before the board, Webb laid out his charges against the president: Dowell lacked experience in higher education; he lacked respect among the students, who hanged him in effigy and hissed when he spoke; he had failed to inspire the faculty; he had lost alumni support; under his management, enrollment lagged significantly behind other Alabama schools in per cent of increase; the buildings and grounds were poorly maintained; and the president had not kept pace with developments at land-grant colleges in neighboring states. A group of Montgomery County alumni, represented by Haygood Patterson, also presented a letter at the hearing, which contained a list of additional charges against President Dowell. The president, they conceded, possessed high moral character, but lacked all the other qualities demanded by his position: intellectual attainments, undaunted courage, love for youth, freedom from political entanglements, diplomacy, and the ability to impose discipline and still maintain respect. Specifically, they condemned Dowell for “not being big enough” for the API presidency; for his failure to resolve “jealousies” among some of the college departments; and for failure to act upon his statement that API suffered from “dry rot.” Patterson argued that there was no precedent for API alumni to involve themselves in college politics without significant cause. He pointed to a series of crises, all of which had occurred in the past five years, wherein alumni felt that the situation warranted their intervention. The issue at hand, he argued, was clearly comparable. One month after the hearing, the board of trustees met to hear a committee report regarding the charges against Dowell and found no grounds for pursuing the investigation. In a series of events that were likened to a “Bolshevik Revolution,” the issue of Dowell’s removal as president of API resurfaced in the fall of 1927. A well-organized group of students began to discuss a course of action that would result in Dowell’s removal. On Sunday, October 2, following API’s loss to Clemson, “ten outstanding men on campus” met to discuss the situation. On Monday night, they called a meeting of twenty-four male students, “the Double Dozen,” who represented the junior and senior classes. The group agreed to dispatch representatives to interview alumni in Montgomery, Birmingham, and Columbus, Georgia. Trustee T.D. Samford suggested that the senior class select a representative to meet with the board’s executive committee, which he chaired. Samford and the senior class representative, L.S. Whitten, subsequently met with Governor Bibb Graves to discuss the matter. Meanwhile, a mass meeting of students called for Dowell’s removal. On October 14, Governor Graves convened a special meeting of the board of trustees where Whitten presented the students’ case before the governor, the board, and President Dowell. Whitten denied that football was “the cause of the unrest or disorder.” Under questioning from the board, he stated that Dowell probably was a good business manager, but neglected the human side of relations with students. He also spoke of an inability on the part of faculty to maintain classroom order. Finally, he mentioned the ill will created by “the Tuxworth affair,” a reference to the suspension of quarterback Frank E. Tuxworth for drinking. Student witnesses also mentioned a lack of cooperation among the president, faculty, and alumni. At least one board member suggested that certain alumni groups had instigated the student rebellion. Dowell was convinced that athletics was the major factor behind criticism of his administration. He conceded to the board that he possibly should have spent “more time on the ball field, in the streets, or in social situations,” but argued that his primary energies had gone into resolving the school’s financial crisis. Three weeks later, on November 5, 1927, President Spright Dowell submitted his resignation. The board selected Bradford Knapp, son of the distinguished agricultural reformer Seaman A. Knapp and president of Oklahoma A&M College, as Dowell’s successor. Victor Hansen, vice chair of the search committee, submitted Knapp’s name to the board, saying the committee had conducted a broad search and assumed that API needed a president who possessed a national reputation as an academic administrator. At the same meeting, T.D. Samford presented a resolution regarding the Alabama Teacher Training Equalization Fund, in which he complained that the state Board of Education had appropriated $20,000 from this source for API and $65,000 for the University of Alabama. He feared that, over the long run, this would give the University of Alabama a disproportionate influence over the state’s primary and secondary schools. (speaking), Edward O'Neal, Mrs. W.F. Jefferson, Mrs. L.W. Spratling, Mrs. 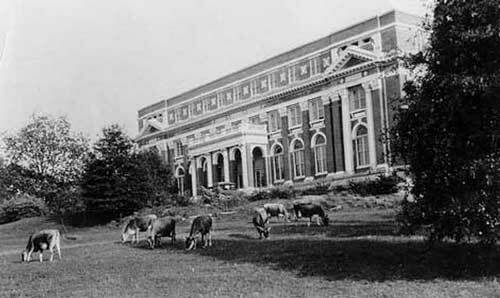 Cows graze in front of Comer Hall in the 1920's. Knapp and other API supporters found still more to criticize regarding the state’s position in the education war with the University of Alabama. 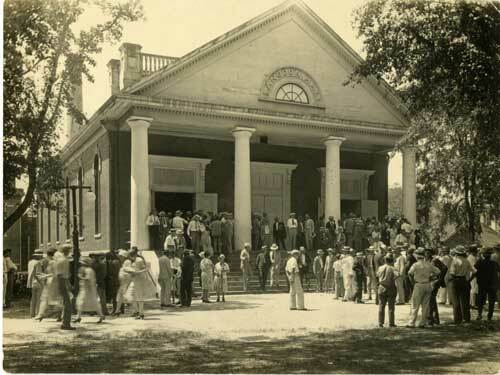 In 1927, the state legislature had approved a funding ratio between API, the University of Alabama, and the state’s women’s college at Montevallo: API received 39 percent, Alabama the same amount, and Montevallo 22 percent. This appeared to give API and Alabama equivalent amounts, but Knapp complained that 25 percent of API’s appropriation was earmarked for the Extension Service and the Experiment Station. The legislature also earmarked 25 percent of Alabama’s appropriation for medicine, extension, and research, but, according to Knapp, gave Tuscaloosa greater flexibility in using these funds. The result was a comparative loss for API. Early in 1931, while President Knapp and the board of trustees sought a solution to the school’s financial crisis, a new controversy began to emerge. For some time, Victor Hansen’s Birmingham News had published editorials attacking a cooperative grain purchasing agreement instituted by the Alabama Farm Bureau Federation and strongly supported by Luther N. Duncan and the Cooperative Extension Service. Hansen’s paper denounced Duncan as “a master of political trickery…probably without a peer, certainly without a superior, in Alabama.” In May, 1931, the Alabama Senate assembled for hearings on a bill that would have killed the Farm Bureau cooperative. Both the Extension Service and the Farm Bureau mustered such a turn out of support for the cooperative that the committee meeting was moved to Montgomery’s Crampton Bowl. Throughout the hearings, President Knapp consistently supported Duncan and the Extension Service, arguing that the proposed bill was not so much anti-extension as it was opposed to cooperation among farmers, who had a right to buy and sell cooperatively. In February, 1932, Knapp issued a report to the board regarding the financial condition of the college. He argued that the financial crisis then besetting API began in the summer of 1931. It stemmed not from mismanagement, but rather from the state’s failure to disburse appropriations. He demonstrated that for the fiscal year beginning July 1, 1931, API had received only one full quarterly appropriation. In essence, the school was operating on money borrowed from its employees, and Knapp urged the board to consider paying interest on back salaries. The alumni account was overdrawn by more than $18,000 and the athletic account was overdrawn by more than $81,000. Under these circumstances, he argued, financial planning was extremely difficult. Knapp augured that unless the school found another source of financial support, it might be forced to close for the 1932-33 academic year. Unfortunately, Knapp faced another blow in the form of a 1932 Brookings Institute report on state and local government in Alabama. According to the report, API’s annual per-student expenditure was nearly twice that of the University of Alabama. The report speculated that either the University of Alabama was under-funded, or that API received too much state funding. In any event, the report recommended a unified administration for the state’s institutions of higher learning. Responding to the report, API officials contended that the University of Alabama’s significantly higher out-of-state enrollment distorted the report’s conclusions. Out-of-state enrollment factored into the equation, the University of Alabama spent 28.8 percent more than API per in-state student, which also meant that scarce Alabama tax dollars were being used to educate out-of-state students at the Tuscaloosa campus. Moreover, the University of Alabama had a higher percentage of students enrolled in relatively inexpensive liberal arts programs, whereas API had greater numbers enrolled in more expensive scientific programs. On July 28, 1932, Knapp reported to the board that he had been operating under extreme stress and the board granted him a leave of absence for the month of August. They also offered to pay his salary during his absence, but Knapp refused to accept preferential treatment. 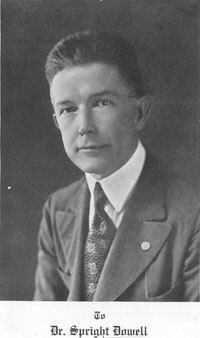 Shortly thereafter, Knapp resigned as president of the Alabama Polytechnic Institute. From Montgomery, Governor B.M. Miller urged the board to appoint an administrative committee rather than an acting president and suggested that George Petrie, dean of the graduate school, Luther N. Duncan, director of the Extension Service, and J.J. Wilmore, dean of the Engineering School, serve as members. Both Dowell and Knapp went on to successful academic careers after leaving API. Spright Dowell became president of Mercer University, where he remained in office for twenty-five years. Bradford Knapp became president of Texas Technological College, a position he held until death. Undoubtedly, both men faced only a slim chance for success at API. Dowell lacked a strong academic background and had not been an overwhelmingly popular choice to begin with. Moreover, Dowell was no match, politically, for the University of Alabama’s powerful supporters in Montgomery, and, rightly or not, he took the blame for API’s unsuccessful football season. Bradford Knapp had much stronger academic credentials, but he too lacked the political savvy necessary to press the school’s interests in the legislature. Additionally, what forward momentum Knapp brought to API was drastically undermined by the onset of the Great Depression. Knapp’s eventual successor brought a degree of political skill that drastically changed API’s fortunes.